Winter in Maine in the 1950’s brings back fond memories sledding down Derby Hill. My friends and I were creative youngsters when it came to homemade sled vehicles for enjoying the snow. The illustration shown is a corrugated tin roof toboggan salvaged from an ancient outbuilding roof somewhere in town. The front was pulled up and shaped to a curve and though short would easily hold a single passenger or two daredevils. On the downside of Derby Hill going into the village there were homes on the right and a huge field on the left with a gradual incline about 200 yards long. Across the road and behind the homes sled trails were made along a 50 foot wide stretch of open space between the homes and dense woods, and featured a steep incline for a fast ride once the trail was packed down. The huge field was different at 150 feet wide and just as long. It was wide open without any major obstacles like trees or rocks, so the only dangerous spot was a 6 foot drop into the ditch along the road. 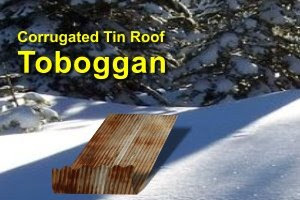 Backing up a bit, I did say we were creative inventing rides like the tin roof toboggan? I didn’t say the idea was brilliant. Ouch! If you can imagine speeding downhill on soft snow riding a sharp and rusty sheet of tin, the inevitable wreck had consequences. A crash meant stitches and a tetanus shot or bandages at the least. In retrospect I think the thrill was worth it. Another beauty tranformed into a toboggan was a 1949 Henry J car hood. Now that baby was safe and could hold half a dozen fools, or more. Imagine the inverted car hood with a high pointed front to plow through the snow and sides to hang onto and hold us in place. Kids in the rear risked being knocked off the back, yet otherwise it was a luxury ride and wrecks were rare. Years later I rode a store bought wooden toboggan. It provided exceptional handling and an okay ride, but the thrill just wasn’t the same as that Henry J hood or the rusty tin roof toboggan.